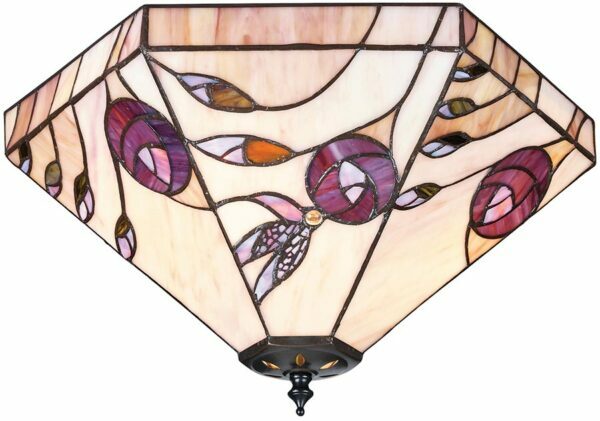 The Damselfly flush 2 lamp, Mackintosh rose inspired Tiffany ceiling light is hand crafted from quality art glass, each piece has been inlaid and soldered by hand using traditional leaded glass techniques. A lovely 40cm flush light, with a concealed ceiling mount and shade attached with a lower finial. The shade features an amber cream background, inlaid with a mauve Mackintosh style rose and dragonfly. The flowing design is finished with the addition of olive green leaves and inlaid lead solder stems. This is a hand-crafted Tiffany shade flush mount and the colours may differ slightly from the image shown, as each piece of glass is hand-made and may differ slightly in colour or shade. This should not be seen as a fault, rather something that makes each Tiffany shade unique. Part of the Damselfly Tiffany lighting range, inspired by the Mackintosh rose with a traditional twist. A wonderful inspired design that will brighten any room. Does the damselfly range have wall lights? Hello Alison. There are no wall lights available in the Damselfly range. Kindest regards, John.